Vava, how about swiching to Armenian gampr? At least the climate in Canada will suit it. Wow, look at these beauties. Khopur is the other name for self-confidence! Nice site! Edited by gamavor, 27 August 2003 - 09:31 PM. 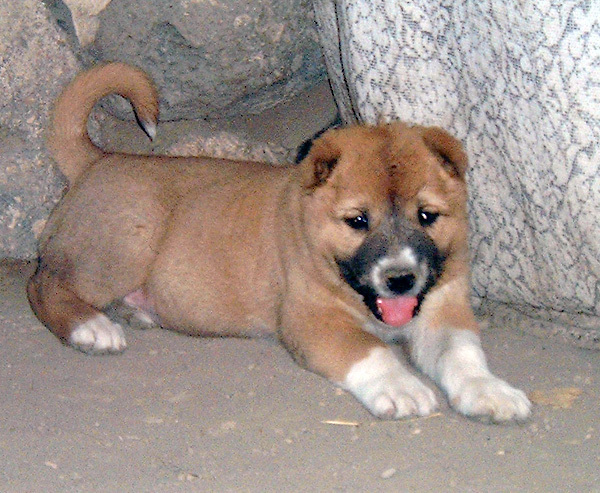 With origins dating back as far as 15000 years, there is little doubt that the Armenian Gampr is the oldest of all Molossers, and quite possibly all mountain dog breeds. The Armenian Plateau is one of the early cradles of civilization and the Gampr is believed to had existed in the highlands of Armenia since the very begining. With limited human interference, two main types of the Gampyr evolved side by side and 3000 years ago the longhaired and the shorthaired variants were formed. 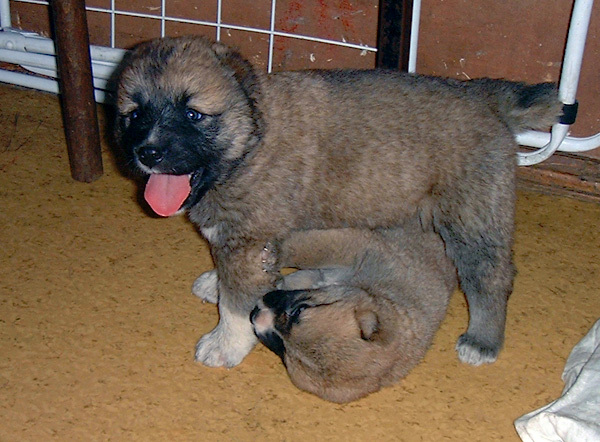 These dogs are considered by most Armenians to be the real Caucasian Sheepdog and Central Asian Shepherd Dog, as well as direct ancestors of most Asian and Turkish breeds. This theory is not very popular, but it does make a lot of sense, especialy when historical facts are considered. When the Turks invaded Armenia in the 9th century A.D. and encountered the Gampr dogs, they were so impressed that they took many of them back to Turkey. 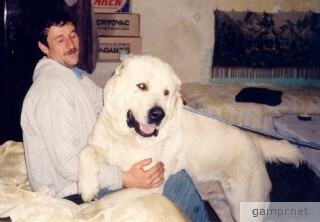 There are reportedly even records in Armenia stating how some of their Gampr Storm Dogs were exported to "a monastery in the Swiss Alps" in the mid 1660's, obviously hinting at the development of the Saint Bernard. The Soviets claimed the Armenian Gampr as Russian, with the Georgian type being favoured by Stalin, the result of which are the divisions still felt today in the Caucasian Ovcharka circles. 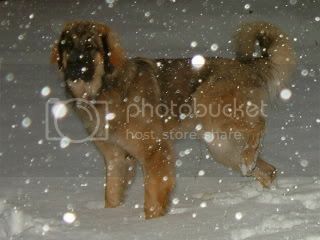 The Turkish Kars Dog is of special interest, seing how Kars was the capitol of Armenia up until the 10th century. When it comes to the standard, it is pretty much non-existant as of yet, just like it has been for ages, due to these dogs being bred for work and not appearance. There are some efforts reported in Armenia to standardize the Gampr today, but for now the best reference are the standards of the Caucasian and Central Asian Ovcharkas. 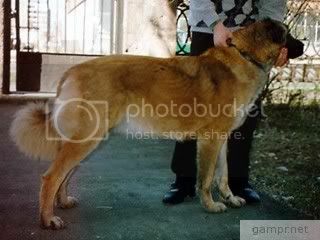 In Armenia, the short-haired lowland type and the long-haired mountain type are considered to be the same dog, separated by coat, which isn't helping the standardization efforts. There are some temperament differences, as well as the traditional customs of cropping the ears and docking the tails of the short-coated dogs, but this varies from place to place. And of course, politics still play a major role in Armenia and neighbouring regions, making any real progress extremely difficult. The Gampyr dogs come in the above-mentioned two coat-types, common in any colour and varying in size anywhere from 25 inches all the way up to 35 inches at the withers. Vava, Gamprs are realy, I mean REALY smart dogs. If you get them as a small puppy you can train them to be nice. However, most of them are breed in mountain farms and their breeders chose to make them angry for the fights. If you get one of those, it is a hell. Some are dangerous. After all, these are born wolf-killers. Their other name in Armenian except for Gampr is Gelkheght, which consists of Gayl (wolf) + Kheghtel (suffocate). Have a look at Khopur. Does it look like any other Dog? No wonder ancient Armenians classified Araletz as a deity. I know few people that have Armenian Sheppard and all of them have different experiences and accounts on them. 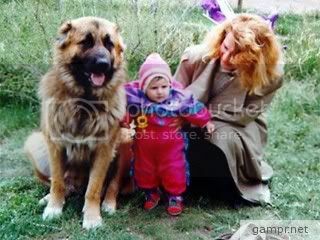 All agree that it is a very special breed and that Armenian Sheppard has very independent nature (one more proof that it is ArmenianJ). Some say it is friendly, some say it is never too close to the Master, some say it is loveable some say it is the master of the household. BTW, Araletz was used in the wars against Persians quite successfully. fek, look at the comparative size of the head! Hi everyone. I promised to pop in once a year or so and now I end up getting here more or less accidentally. I was looking for info on the Gamp'r and it turns out that the Hye forum has discussed it. I AM surprised though to find it here in General/other, why not put it in Culture? I also found the gampr.net link, but it seems as if not much new has happened around this breed lately? 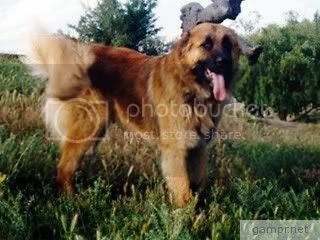 Anyway, the funny things is, I also found the 100 Gampr pics in the database and it turns out that not only is the Gampr the ancestor of our dogs (Leonbergers) but also I found some looking exactly like them. Edited by EZ, 30 January 2006 - 02:41 PM. 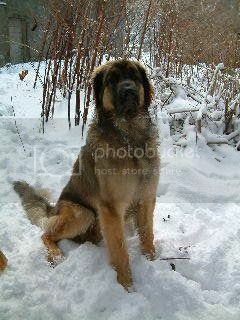 The Armenian name for Leonberger should be Levonkiughatsi or better Kiughatsi Levon! They are HUGE Gams. But they're cute. 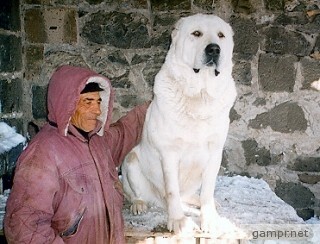 The Armenian gampr is still the breed it has been for thousands of years. In order for the breed to maintain its integrity as a useful, reliable guardian, strict and thorough measures must be in place to assure correct breeding practices. Outside of the native country, any gampr is at risk to a variety of misuses and misrepresentations. Armenia is a small country where there remain local shepherds in the hills, eking out a living the way their ancestors had for thousands of years. 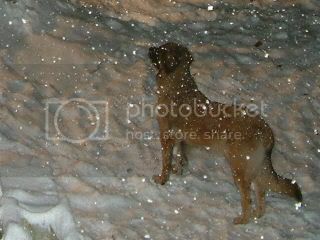 Many travelers to the cities never even know that the dogs exist, including Armenians who visit their homeland regularly. The native dogs and shepherds live the way they always have, and in so doing will hopefully be able to maintain the integrity of the breed that began 15,000 years ago. The goal of the AGCA is to maintain the gampr breed in its most pure, original manifestation as the ideal livestock guardian and human companion, as physically and mentally sound as it was for the last several thousand years." my mom's cousin's son is breeding 2 of them, I don't think they are in the list of those 15, also another family I say around Reseda area about a week ago had three!!! It would be a good idea if those owners would (at least) report their dog(s) to the club. They are seeking official recognition for the breed (in the USA), so the more that will join, the better. This could also help establish recognition of the Gamprs in Armenia in the end by kennel clubs elsewhere. btw. I still think this topic shouldn't be in General/Other. It clearly belongs in Culture and should perhaps have it's own category. So, I now officially request to move it there. ... Mosjan? PS. nice to see you haw have you been ?? Vava, have you Ever or Never seen one? Movses, likewise, I'll send you a PM.